This post provides some information about what is mean by performance of evaporator, how performance of evaporator can be increased. Basically the performance of evaporator depends upon its capacity and economy. Let us discuss these terms one by one. Capacity of evaporator is defined as the number of kilograms of water vaporized/evaporated per hour. The rate of heat transfer Q through the heating surface of evaporator is the product of heat transfer coefficient, heat transfer surface area and the overall temperature drop. The capacity of an evaporator depends upon the temperature of the feed solution. If the feed solution is at the boiling temperature corresponding to the pressure in vapor space of an evaporator, all the heat supplied will be utilized for evaporation, thus increasing the capacity of evaporator. Similarly if the cold feed solution is fed in the evaporator, initially some energy will be required to increase the temperature of the feed solution to the boiling point of the solution corresponding to the vapor pressure inside an evaporator. In some cases this amount energy may be very high. Thus the capacity of evaporator will be reduced. Economy of the evaporator is another important parameter which decides the performance of evaporator. It may be defined as the amount of steam used and is expressed in terms of pounds of vapor produced per pound of steam supplied to the evaporator train. In multiple effect evaporation system, the vapor produced in the first stage is used as energy source (heat) for the second stage and so on. Thus increasing the economy of evaporator. For example, in three effect evaporator if 1Kg. of steam is supplied to the first stage 2.5 Kg. steam is produced. 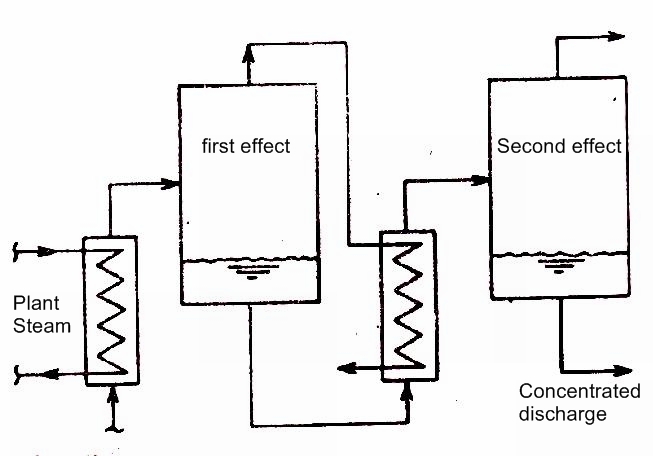 In vapor recompression method, vapor from the evaporator is compressed to increase its temperature so that it will condensate at temperature higher enough to permit its use as a heating media in the same evaporator. Hydroelectric power plant – hydropower. This is a great presentation. Thanking you for this knowledge.